A union has called a 24-hour strike on the Tube network for New Year's Eve. The 4,000 Members of the Rail Maritime and Transport (RMT) voted five to one for the industrial action over staffing levels and will walk out at midday. The RMT fears plans by London Underground (LU), including closing ticket offices, could lead to job losses and compromise safety. LU and RMT officials are to meet on Friday morning at conciliation service Acas to try to resolve the dispute. Tube bosses said they were redeploying staff to more "visible positions" and there would be no cuts. Another 24-hour strike has also been called for 8 January which will begin at 1830 GMT. BBC London's transport correspondent Andrew Winstanley said the strikes would severely disrupt services. 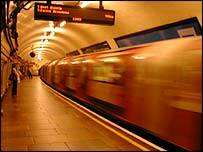 The New Year's Eve stoppage could prevent the Tube running all night on 31 December. Transport for London had already announced the continuous running with the Tube being free from 2345 GMT on New Year's Eve until 0430 GMT on New Year's Day. Last December the RMT agreed a deal which would effectively create a 35-hour week for Tube station staff. But RMT general secretary Bob Crow said the strike vote had been taken because of Tube bosses "back-door attempts to displace hundreds of safety-critical station staff under spurious cover" of the deal. Mr Crow added: "The RMT will not accept any dilution of safety standards either for our members, or Tube users and we hope that the travelling public will join us in calling on London Underground to step back from the brink and start talking to us seriously." He said the RMT headquarters would shut down for Christmas at 1700 on Friday and not reopen until 1 January, so management had "better get a move on". A London Underground spokesman said: "There are no staff cuts across the Tube network. "London Underground and the RMT agreed to implement a shorter working week, as long as it came at no extra cost to the Tube fare payers. "This means some staff being redeployed from ticket offices to station platforms and ticket halls, which can also boost reassurance for our passengers and security." London Mayor Ken Livingstone said Mr Crow hailed the deal last year as "ground breaking" and said there was no question of renegotiating. Mr Livingstone said: "There can be no justification for the RMT now reneging on its agreement and trying to ruin New Year's Eve for thousands of Londoners. "